SWF Flash movie files are relatively difficult to create (for armatures) and editing them is even more difficult. Free program “SWF Modify” allows you to edit Flash SWF file with ease. 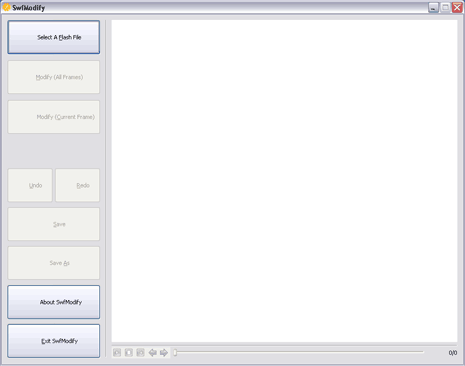 It allows you to modify and edit frames contained in a SWF flash movie file. You can preview play the modified file and save it for future use. 1. Allows you to delete items from Flash movie. 2. Replace any item with text or picture. 3. Export shape, movieclip and sound resource. 4. Image support transparent background. 5. Open SWF file & allows editing of its frames. Download SWF Modify to edit and modify SWF flash movie files on the fly. It supports Windows 7,a Vista, XP and is all free for download, use. Please help me. I downloaded SWFModify and I imported a SWF file into it OK. I tried to modify a frame that was a text frame. It would not let me modify the text in the frame, but it lets me overlay my own text. However, when I tried to save my change, it would not let me save it. I am looking for a tutorial on SWFModify but cannot seem to find one anywhere.